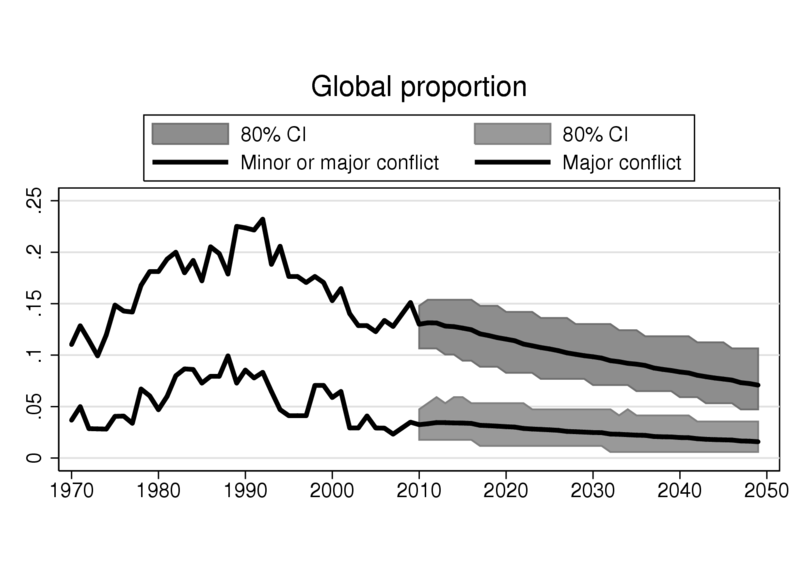 Is the projected decline in internal armed conflict at all plausible? Our predicted trend in conflict is a function of the trends in our predictor variables. Some of these trends indicate an increase in conflict, whereas others suggest a decrease. The figure below shows the historic and forecasted trends in the most important predictors: population size, infant mortality rates, education, youth population, and time in peace. One factor that points to an increase in conflict is population size. Statistical studies of internal armed conflict typically find that a 1% increase in population is associated with a 0.3% increase in the risk of conflict. The green line in the figure above shows that the UN estimates that the global population will increase from 7 billions today to about 9.5 billion in 2050. (The UN has recently adjusted these estimates and expect a somewhat higher population growth than indicated here.) The population growth will be particularly strong in Africa south of Sahara. This population growth, if not countered by other factors, indicates a considerable increase in conflict in the future. Improvements to our development variables – education and infant mortality rates – more than outweigh population growth. The world has developed steadily since the 1950s and will continue to do so over the next 40 years. The blue line in the figure shows that on average more than half of countries’ male population in the age group 20-24 years did not have secondary education in 1970. In 2009, this share was reduced to 30%, and the IIASA expects it to decline to less than 15% in 2050. Average infant mortality rates (the orange line) have decreased from about 85 in 1970 to 35 today, and the UN expects it to be reduced by another 50% over the next 40 years. The proportion of population that is young will also continue to decline (the black line). There are several explanations for the finding that armed conflict declines with socio-economic development (see Gat 2006 and Pinker 2011 for discussions). Some of them are economic. Economic development requires occupational diversification and specialization, and thereby weaves large numbers of individuals, groups, and countries together in a web of interdependence. Armed conflicts are severe threats to such networks. With development, the negative consequences of conflict reach much further. These costs tend to restrain actors in social conflicts, in particular when the economic networks also bind members of different social groups together. Many conflicts are fought over assets that are profitable to them that control it militarily. Economic development also implies a substantial increase in the importance of input factors that cannot be taken by force. Financial capital, for instance, can easily be shifted abroad if actors threaten to get hold of it by means of force. Skilled labor is also more difficult to make profitable against their will than non-skilled ones. When more of the wealth is safe from attempts to take it by force, the incentives for warfare are much smaller. Development is also associated with protection of property rights and respect for contractual agreements that stimulates investment and discourages large-scale violent theft. Education and literacy stimulates a concern for people outside immediate kin that may moderate inter-group or inter-religious hostilities. Additionally, development is associated with the development of representative political institutions that provide fora for non-violent resolution of conflict. Finally, development is associated with an improvement in governments’ capacity to maintain order in own territory. Another of our predictors is a variable capturing the number of years in peace in a country up to the present. This also reflects the ability of governments to maintain the monopoly of violence. The red line in the figure shows the average number of years countries have been in continuous peace either since independence or since the most recent conflict. This average doubled from about 13 years in 1970 to 27 in 2009. Internal armed conflicts typically last for several years, and the risk of conflict recurrence is high for many years after an initial ceasefire. Several countries have succeeded in escaping this ‘conflict trap’, as indicated by the red line. Decolonialization in Asia and Africa provides a partial explanation of the increase in the proportion of countries in conflict up to 1990. It generated a large number of newly independent low-income countries that soon fell into conflict. This caused a steady accumulation of conflicts up to 1990. The 1990s was a turning point partly because of the end of the cold war and its hot proxy wars, and the new-found ability of the UN to set up effective peacekeeping operations. But the 1990s was also a time when the positive effects of socio-economic development and consolidation of states started to roughly outweigh the impact of population growth, decolonialization, and the troubles generated by recent conflicts in countries and their immediate neighborhoods.